Indeed, ideals to live by then and now…. 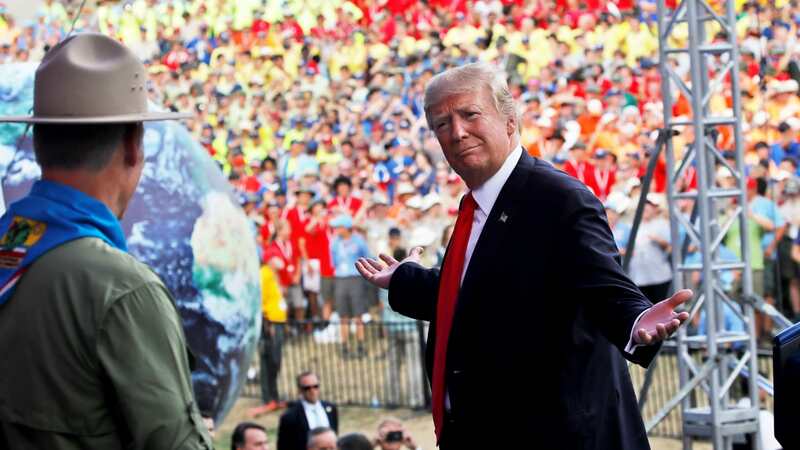 As a former Scout, I was appalled by Donald Trump’s speech at the Jamboree yesterday. Appalled, mind you, but not surprised; I concluded long ago that Trump simply is neither very learned nor very eloquent and had he been born poor, Black or Brown with the same limited set of tools in the mental toolbox, he would be a minimum wage earner–maybe. But as we all know, Trump was to the proverbial “Manor born” and while he is wealthy, he is so dim-witted that when he takes the mic or to Twitter to express himself, it usually is in the form of an ad hominem attack on foes and friends alike, or by uttering something insane, inane or ignorant about domestic or foreign policy. But when history is written centuries from now, if the American Republic by the year 2217 is a shell of its current self, I truly believe that this modern era of “Know Nothing” behavior, one in which scholarly pursuits in mathematics, grammar, the sciences and even government are so frowned upon that the Oval Office is now occupied by a man who, if his school transcripts are ever released, quite likely was a poor student who got into and out of Penn only because he was Little Lord Fauntleroy, will be the reason for its inevitable decline and fall. Meaning, as bad as Trump is, there are similarly ignorant, under educated, bigoted and xenophobic politicians across the ideological divide just waiting for a chance to make America worse through their policy positions.